Them & Us at Northern Stage, Newcastle. Lighting design, Andrew Ellis, Michael Nunn and William Trevitt. Photo: Tristram Kenton. I know nothing about dance. Like, really nothing. Seriously, people, I don’t even watch Strictly. Last time I went to the ballet – a freebie, with a friend, because there was no way I’m paying cash money for that stuff, ballet tickets are expensive – I bemoaned the fact that it didn’t have surtitles, the way foreign operas do, to explain the storyline to bewildered newbies like me. (An experience that made me feel even more like a scruffy trespasser among the fancy folk because before they’d even let me in the bloody building, the ushers not only searched my bag but made me open my bottle of water, to prove I wasn’t sneaking in alcoholic contraband. Thank you, four-time winner of North East’s Most Welcoming Theatre award, Newcastle Theatre Royal). This might make me an odd, if not downright perverse, choice to review a new dance show (though if you’re reading Exeunt, chances are you already know we don’t fear offbeat choices). Or… maybe it doesn’t. BalletBoyz, after all, are a company whose ethos seems to be to free dance from its traditional confines, to bring it to audiences who might be intimidated by all the posh costumes and unwritten rules of more classic productions. (At least this is what I gather, from the hasty and panicked scan of their website I make after I have foolishly agreed to attend the show). Maybe they are just the company to educate a dance ignoramus like me. So, would I be won over? Or would I just be baffled and bored? Boredom, at least, is quickly ruled off the table. The first half of the show is Them, a piece devised by the ensemble and set to a score by Charlotte Harding. Designed to showcase the individual skills of the dancers, it leaves the viewer in no doubt as to their talents. The stage is bare but for a large steel-framed cube, which gives an almost hypnotic focus to the dancers’ movements. They climb and clamber on it, rotate it, lift it, manipulate it so deftly it takes on its own persona, becoming an extra performer – so much that I miss it when, after the interval, it fails to make a return appearance. I struggle to find a story – if story indeed there is – but am fascinated nonetheless by the agility of the dancers. 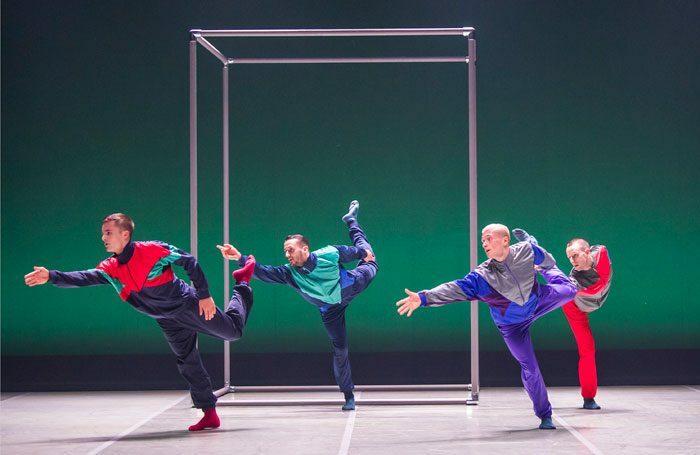 Being stripped of the frills and fripperies of traditional ballet – the men are clad in tracksuits throughout – gives the performance a pleasing rawness and immediacy. The dancing is combative and collaborative in turn, fluid and athletic, and even to the uninitiated and uninformed, it throbs with force and feeling. Spun out of an earlier work, Christopher Wheeldon’s Us is a more romantic work, featuring an evocative score by Keaton Henson, with a stunning duet at its heart. Having abandoned their tracksuits for more formal attire, the dancers are all gussied up as if for a wedding, and the piece is seamed through with passion and love. Bodies fold onto each other like origami, puzzle pieces tested against one another until they fit. It’s still a rare thing to see male bodies being tender to one another – in life, on stage – and the power of such a display is undeniable. I remain, it’s true, a novice. Even moved as I was – and the finale of Us is truly transporting – I’m a little baffled when whole rows of the audience roar to their feet at the end of the show, clattering loud applause. Was it really that good, that unusual? Perhaps, if you really understood it, it was. Clearly, it’s a production with plenty to offer the discerning. For those, like me, willing to be converted, it’s not a bad place to start. BalletBoyz: Them & Us runs at Northern Stage until 23 March, then tours until 28 April. More info here.